White mustang on a red lettering card. Matchbox Superfast Carry Case + 48 Models,41 x Mint,7 x Nr Mint,Superb,1970's. Vintage 60's & 70's Lesney Matchbox Lot of 31 Cars Black Wheel Nice L@@K@!!!!!!! June 19th, 1947, Lesney Products was formed by Leslie Smith and Rodney Smith without a definite decision on what the company would produce. The name Lesney came from the first and last three letters of their name. Jack Odell, a diecast expert, joined the newly formed company. By 1948, this new British manufacturer started to produce smaller odd diecast toys for kids. Today, this production is known by collectors as the Early Lesney Toys. Although the English industry thought the Lesney products were of low quality, the children loved them. The demand was steadily increasing. Coronation Coach, the First Major Commercial Success? The British toy maker was responsible for replicating the Queen's Elisabeth II's Coronation Coach in a very small size. The replica issued in 1952 was a toy meant for kids to play with and it was about 15 ¾ inches long. The replica of the Queen's Coach came in either silver or gold color and it was pulled by eight white horses being directed by four riders wearing red jackets. It sold. In 1953, there was another miniature production of the Coronation coach which was a smaller model. It was about 4 ½ inches long. This version of the matchbox toy was a great seller both on local market and abroad and is now referred as the million selling model. In 1953, the Lesney Products made a deal with Moses Kohnstam, owner of a toy packaging and distributing compagny, Moko (MOses KOhnstam). Moko was already offering the same services to other small toy manufacturers. This is the reason why collectors can find Moko on non Lesney products. In 1958, disagreement between partners over expansion in Japan was the end of the partnership between Moko and Lesney. In 1959, Lesney bought back Moko's share of Lesney. The toy designer Jack Odell resized a road roller for his daughter Anne so that she could go to school with a toy that could fit inside a matchbox as required by the school. He chose to paint the toy green and red so as to give it a good look. All the other children who attended the school wanted to have the same toy. This event influenced Jack.Odell and the Lesney Company to start developing small size toys. By the end of the year 1953, they launched a new line of diecast toys which was named the Matchbox toys because of the size of the toys; it could fit in a match box. The cars were very small but this did not stop the Lesney Company from paying attention to every detail on the toys. Know today as the Regular Wheel 1-75 series, they were produced from 1953 to 1969. Since their prices were very affordable, most of the kids could own at least one Matchbox car. By the start of the year 1954, the company was producing about 50 million Matchbox Toys per year. Collectors have categorised those cars in 5 series, A, B, C, D and E; each series having a potential 75 models (1 to 75). Series A (75 models) and B (75 models) are complete while series C (58 models), D (28 models) and E (only 4) have missing numbers. There is a total of 240 different models and almost all of those models have one or more variations. Most common variations are the wheels. Matchbox die cast originally came with metal wheels then, gray plastic wheels, silver plastic wheels and black plastic wheels. Different colors, lettering, windows, decals or labels constitute the vast majority of variations. 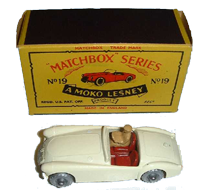 Some collectors also search for Moko Lesney Matchbox box variations. Mattel, a new player in the pocket car industry changed everything with the introduction of Hot Wheels in 1968. In 1969, Matchbox was forced to move to a faster type of wheels, the Superfast. By 1970, all Matchbox cars had Superfast wheels. Matchbox are generally collected MIB or near mint in boxes although some collectors buy them without box. Usually, the box is worth around half the value of the car. Variation is a key factor, rare variations selling more than 100 times the common car. We recommend investing in a good book like The Encyclopedia of Matchbox by Charlie Mack. In 1982, the British toy manufacturer went bankrupt and the company was taken over and run by several enterprises. Sold in 1992 to Tyco, Matchbox is now owned by Mattel. I found this great site that showcases only the best Matchbox auctions. Team also suggest that you sign up for the Matchbox newsletter.